Ghum piye ja rahay hain....! Says movie's tagline. But is it so? I did find out in Lovestory 2050. This friday was a fest for me. Two big movies, anticipation was on high, competetion [sort of] was high, even budget for Lovestory was so high, naturally expectations were equally high. [not actually, i do judge movies by trailers, and i thought exactly what i m feeling after watchin movie]. So Lovestory 2050. There I was. It's a movie about poor little rich boy, havin mother in skies [dead] talking to her, complaining why business tycoon dad dont care about him, poor little rich boy, loves danger to hide his sorrows. Suddenly get to meet miss chulbuli Sanaa on a vacation, instantly falls for her. And so on..but there is always something in store for our debutant Actor. So there, he loses her and goes to the future through his uncle Ya's [Boman Irani] Time Machine, to find out her in her Re Incarnation. Enter 2050. Flying cars, serving robots [still xbox 360 is there !!!!!]. The imaging fest starts here. Things go on and on... its "kaho na pyar hai' in futuristic mode. So this is what Lovestory have to offer. Talking about first half, introduction scene is somewhat different showing Harman Racing his dad's car. Ok ok, but i did find out what's in store by that scene itself. Bad dubbing was there. Lip sync was not in place. In first scene?? this continued in so many scenes. OK, THEN in next ten minutes you are watching more and more of Harman acts and more acts. Please, cant we be normal, and show normal things? Priyanka looks really out of this world [very fat, and not so bright]. Lovestory goes on and on. With some hummable music [at last,annu malik is on]. i personaly like Meelon ka jaise tha faasla. Audience waiting impatiencely for time machine to come, but hey relax. This is a hindi movie. you have to wait for intermission for main theme of movie. Just like krrish. Where krrish is seen only after intermission. Here also future enters just at the time of interval. and we get goosebumps to see our very own mumbai in 2050. Yes, this movie makes score overhere. No doubt we have seen 10 times better SFX in hollywood movies, seen greater imaging about future, but hey, here they are showing our very own Mumbai- Gateway of india. there everyone, future is there, nice effort made by SFX people. Their sweat and blood we can see on screen, so i will never bully the SFX side. We are growing up in that, and this is an example. Sets are good and seems futuristic. Especially i did like Priyanka's room. Wher sanskrit shlokas are written over walls. 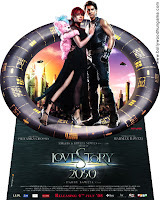 So story moves on in future, showing new priyanka as Ziesha. Humming bad song 'Loverboy' as a world famous popstar. now its our hero's duty to remind of her 'agla janam' and he does it. Enter a baddy. just like darth vader. but finally, Hero wins over everything. Performance wise, Harman has a lot to learn. He just cant act. He looks like hrithik, dance like him and even Sounds like him. He has to find out something unique to show off himself. Priyanka is wasted totally. She is totally out of her form. She looks bad as a red haired popstar. and looks fat as a chulbully girl. You need a makeover baby. Chemistry between the two is purely missing. Boman is wasted. Child artists are bad. Direction is out of place. first half is really bad. and second half is ok to make audience to sit on seats just because of SFX people. Not great but sort of good. Editing is not so well. Choreography is good. as well as songs, for a first timer, these songs are well made. This movie is solely a SFX and art director's film. Otherwise it has nothing to offer in it. Even the movie ends just in a second where we just cant expect.suddenly. And we come out having only flying cars in our heads. There it is, future. NOt so bright for this movie. If it do well, then only because of the theme, that indian audience has rarely seen on bollywood screen. otherwise a bad debut for Harman. Take acting lessons from PC, dude. So its a popcorn movie, 2.5 stars out of 5 i would like to give. Just because of blood and sweat of SFX people.